Kindergarten-3rd graders. 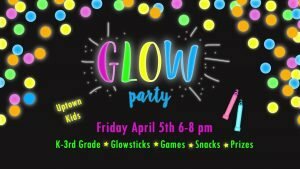 Come join us for a glow-in-the-dark party! We’ll have tons of glowsticks, a big game to play together, and a prize for the best glow outfit! No cost, snacks provided, parents can choose to stay. Friday, April 5th from 6-8pm.